Earlier today I completed the S47 Mingerhout Loop road before starting the second route of the day. 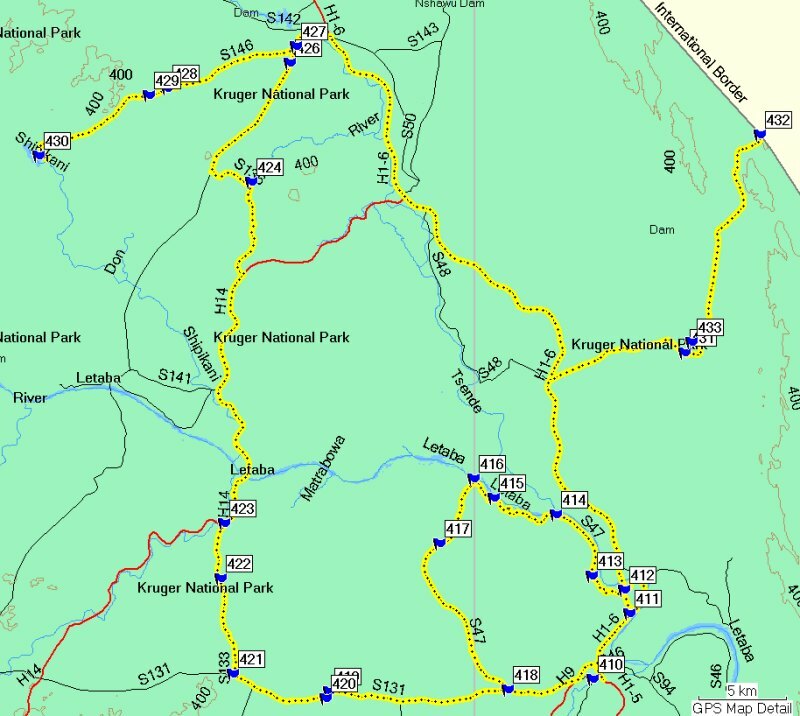 This route would start at waypoint 418 from where I would drive east down the S131, turn north onto the S133 cross the Letaba River on the H14 before entering the S136 private road via Boulders … this was necessary so that I could complete the challenging long distance drive for the day. The challenge was the result of having to complete 2 long cul-de-sac drives. The first one was about 20 kms south west from Mopani Camp south west to Staplekop Dam and the second was the drive north east from the main Mopani to Letaba H1-6 road to Giriyondo. 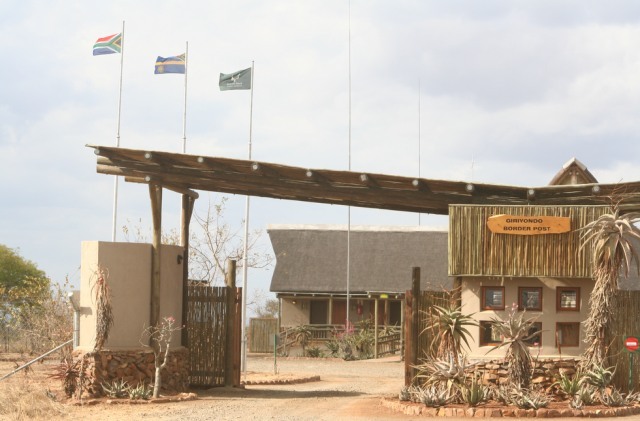 The border post at Giriyondo was officially opened a couple of weeks earlier by the 3 Presidents of the new Transfrontier Park venture … the Presidents of South Africa, Mozambique and Zimbabwe. Take a look at the map (click to enlarge) and you will the scale of the route. 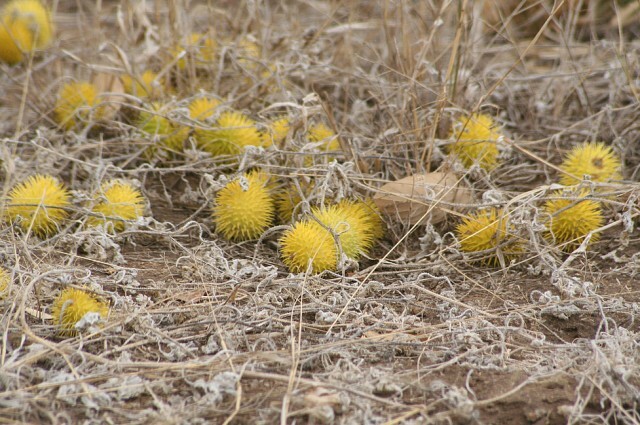 Earlier in the drive today I’d seen a most remarkable bright yellow spiky fruit close to the Letaba River. It reminded me of the Leonotis leonurus also known as the wild Dagga plant I had first seen close to Punda Maria in May but the colour was completely different and those fruits faded to a drab brown after a period of green and pink fruiting period. 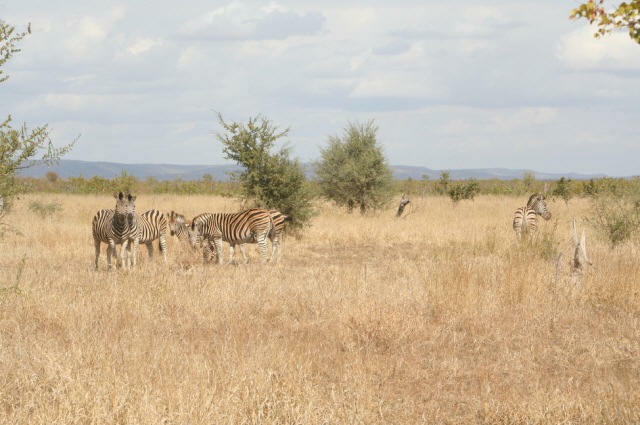 The drive along the S131 was somewhat uninspiring today although a large herd of Zebra was to be seen … maybe because of the excellent drive I’d just completed around the Mingerhout Loop. At waypoint 419 we crossed the N’Wanetsi and at 420 was the N’wanetsi watering point where a group of turtle were sunbathing on the edge of the water. Doves were also collecting to drink with the windmill spinning in the background. At this point there were signs of a lot of Elephant damage. Waypoint 421 was the junction with the S133 where we headed almost directly north. Waypoint 422 was the Jumbo watering point. Shortly after this we came to the Letaba low level bridge where I got a good shot of a Giant Kingfisher and also shots of a Pied Kingfisher hovering above the water. There were 3 Saddle-billed Storks on the sandbank in the middle distance. I classed this as unusual since I’d only ever seen a maximum of 2 before in a single gathering. 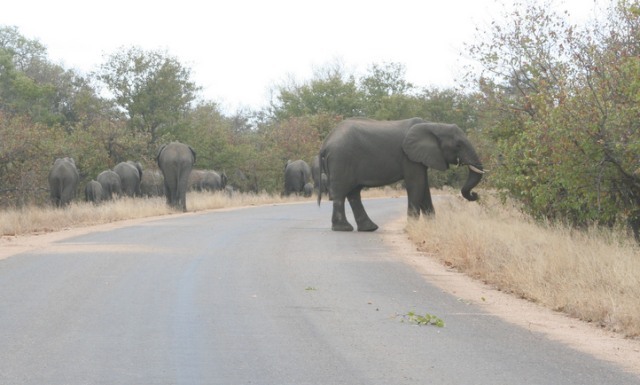 Shortly after leaving the Letaba low level bridge behind I encountered my second Elephant Jam of the day. A family of Elephants had taken charge of the main tar road and once again were extremely reluctant to move. The delay was about 15 minutes but well worth the wait to be able to watch the antics of a few of the youngsters in the group. I’d already seen a number of Giraffe along the S131 but stopped to take a good look at one close to the road. 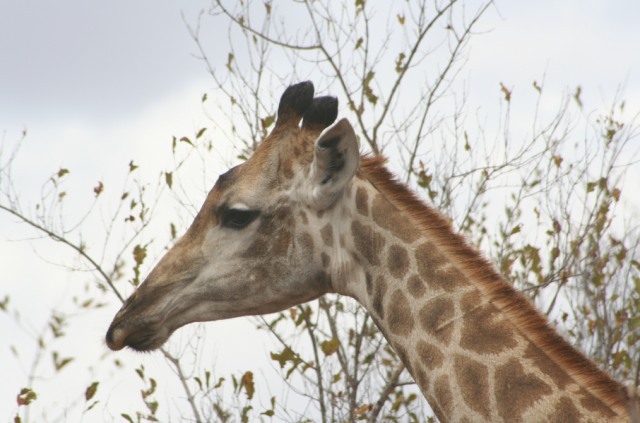 I show a close up shot of the Giraffe from which you can tell, with almost 100% certainty, that it is female. Take note of the horns and they are covered in black hair. This is unusual for males since male Giraffes fight each by banging their horns against the neck of the opponent and over a period of time they lose the hair on top of the horns … they become bald. At waypoint 423 I “broke the Park rules” by entering the private road to Boulders Camp. In view of the 2 Elephant jams I had little option but to take this road and save about a 16 kms drive I’d previously reported on. Otherwise I’d be stuck for time to complete my drives. I even decided to take a quick peek at the camp without entering it … once you’re close to the Boulders Camp there is no doubt why it is called Boulders. There are a series of Koppies seemingly built from large (massive actually) roundish boulders stacked solidly one on top of another. Coming out at the end of the Boulders road just before waypoint 427 is an airfield. This waypoint was a 4 way junction and I turned onto the road S146 leading to Staplekop Dam, running south west. At waypoint 428 was a dry river bed which was the only feature I’d seen up to that point. 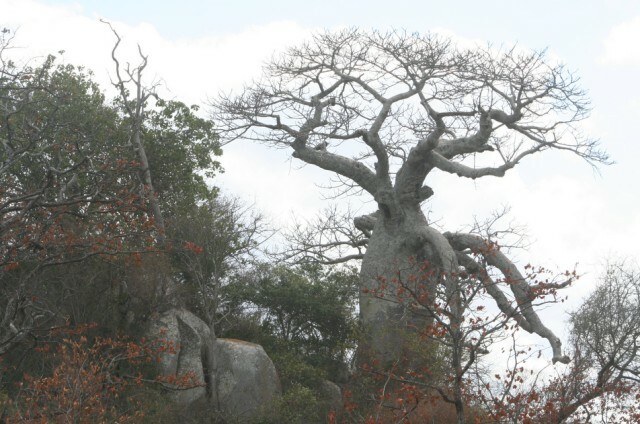 429 was an impressive boulder koppie with an old and normal yet still seemingly haggard Baobab tree on the koppie. Some 8 kms after the Baobab I reached the impressive and quite large Staplekop Dam. 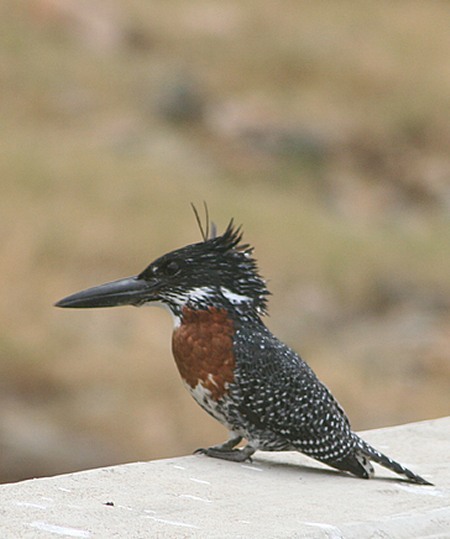 There were a number of birds around the Dam and a single Waterbuck was also seen. Dead trees poked from beneath the water surface. I would think, given the remoteness of this dam, it may well be a very interesting place to spend some time. There was a large tree growing out of an old termite mound. The Dam was created by damming the Shipikana River (meaning is a small hoe) after an implement was found on the banks of the creek. It almost certainly sees little in terms of visitors. During my travelling in both directions over a period of some 90 minutes I never saw a single other vehicle. The road runs parallel to overhead cables so I presume this road was probably an older service road recently improved and opened up to visitors. If you look at the map you’ll notice this dam is exactly opposite the Giriyondo border post 41 kms east as the crow flies. This is where I would be heading next but in a somewhat circuitous route rather than a straight line. The distance I would travel to get there would be 63 kms. Driving south down towards the H15 it was possible to see 3 impressive koppies to the west, the most prominent of which is called Ngodzi named after the Red-billed Quelea finch (largest bird species by mass across the entire Park) which is a seed eater and that is the literal translation from Tsonga. Ngodzi is some 5 kms east of Boulders Camp. There’s always something interesting about driving in the Kruger. Yes, it’s far more than the Big 5. The border crossing into the Transfrontier Park is open only to 4 wheeled vehicles at this stage until the roads have been improved. No commercial traffic or taxis (without permits) are allowed through the crossing. I was told by the KNP staff that about 20 people per day were using the crossing at this time. Waypoint 431 on the way to Giriyondo is the Masiterata Creek, a tributary of the Makhadzi Creek (meaning “magistrate”) close to the Makhadzi Picnic Spot (waypoint 433) where nobody was to be seen. There is an interesting information building at the Picnic Spot where I spent 15 minutes learning of Steinaeckers Horse. This whole area is if some historical significance revolving around the exploits of Steinaeckers Horse (regiment). 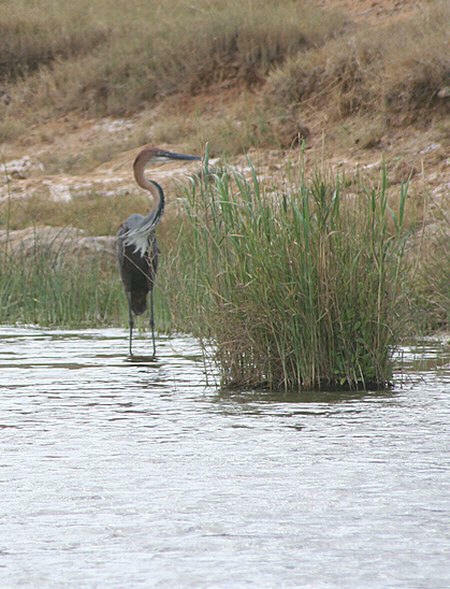 Close to the Makhadzi Creek I saw this large member of the heron family and he is not named Goliath for nothing. It is a huge bird. 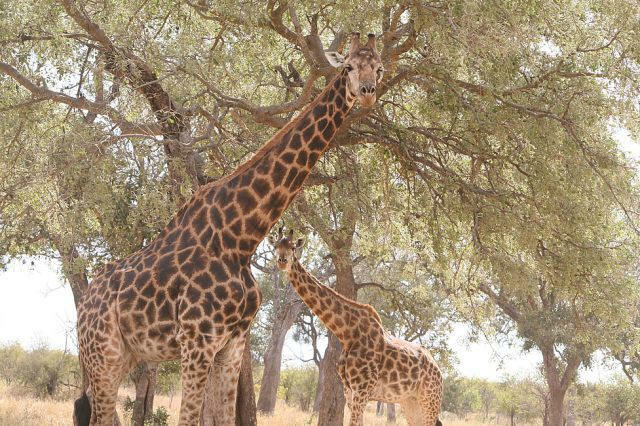 Then there were the graceful Giraffe and Zebra to be seen at regular intervals along the S146. By the time I got back to Letaba Camp I’d covered some 280 kms in 11 hours. It had been a hard day but another wonderful experience here in the Kruger National Park Wilderness. I was looking forward to tomorrow.